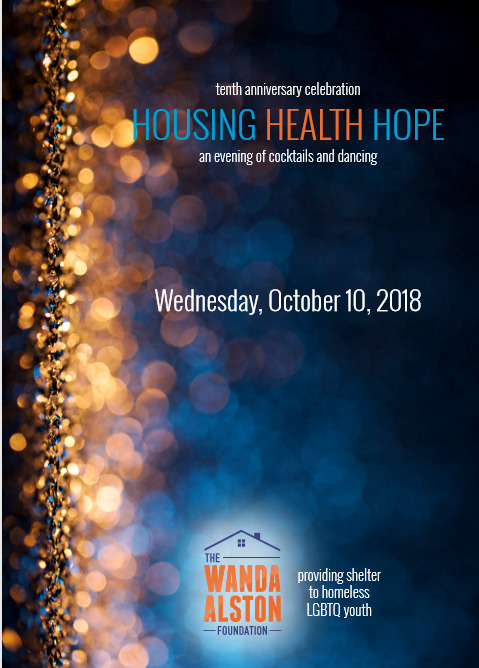 For the past 10 years, the Wanda Alston Foundation has provided housing, health and hope to the most vulnerable LGBTQ homeless youth in the District of Columbia. On October 10, 2018, we will host a cocktail reception to celebrate our 10th Anniversary. Join us to celebrate our legacy, history, and achievement of creating a safe and welcoming home for DC’s most at-risk population – its homeless children! As we prepare to celebrate this momentous occasion, we ask that you consider joining our host committee – buy simply agreeing to sell 5 tickets to the event @ $200 each ($1,000). You can use the drop-down donation box below to pay your commitment. We are proud of our accomplishments and we look forward to celebrating with you on October 10, 2018.